This recipe is fast, easy and a huge hit with the kids. I keep this cookie dough on hand in the freezer portioned out for one dozen cookies in each container so we can make just a few on occasion. 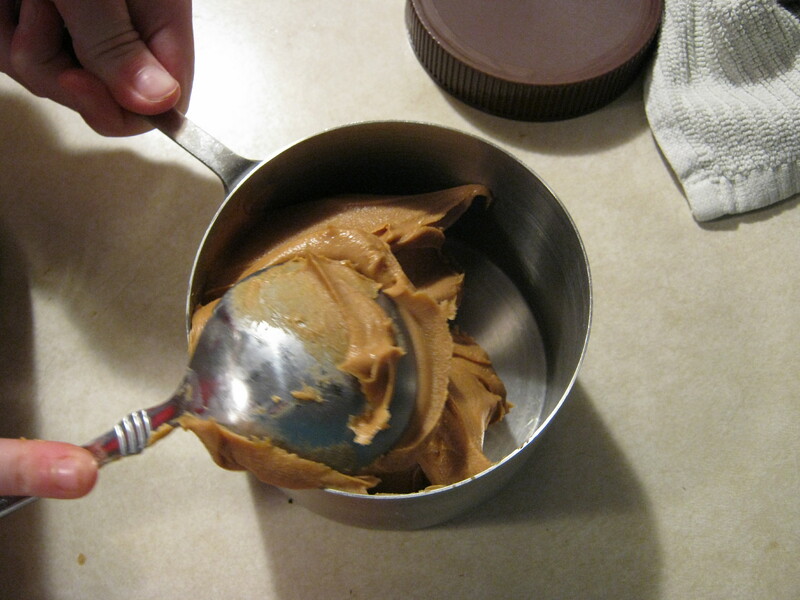 If your kids can’t do peanut butter, it works equally well with any other nut butter or sunflower seed butter. 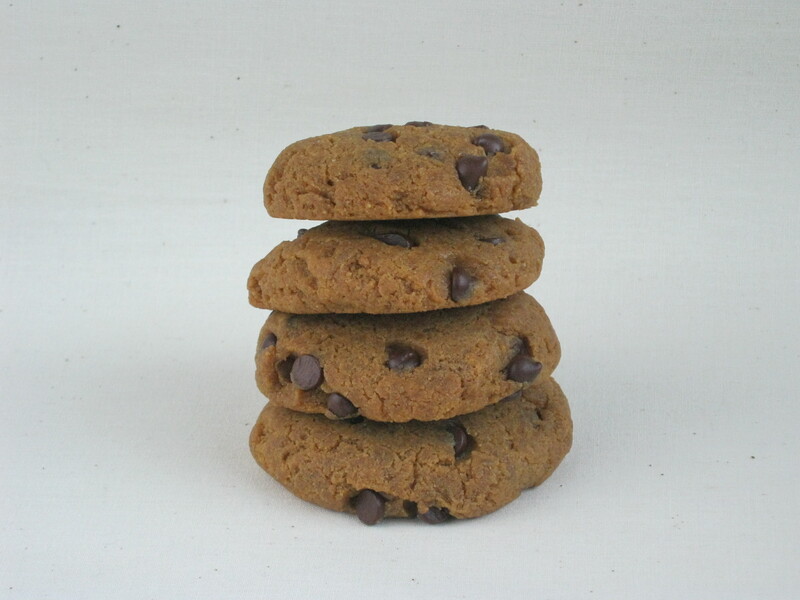 SunGold Sunnut Butter is run in a dedicated gluten and nut-free environment. It’s a great alternative to peanut butter for those allergic to peanuts. The full, printable recipe is below. This is a photo-intensive post that shows you each step. First, mix the eggs, vanilla, Concentrace, rapadura and salt in a bowl. Wait until the rapadura dissolves completely. Meanwhile, whisk the dry ingredients together. And measure out the peanut butter. 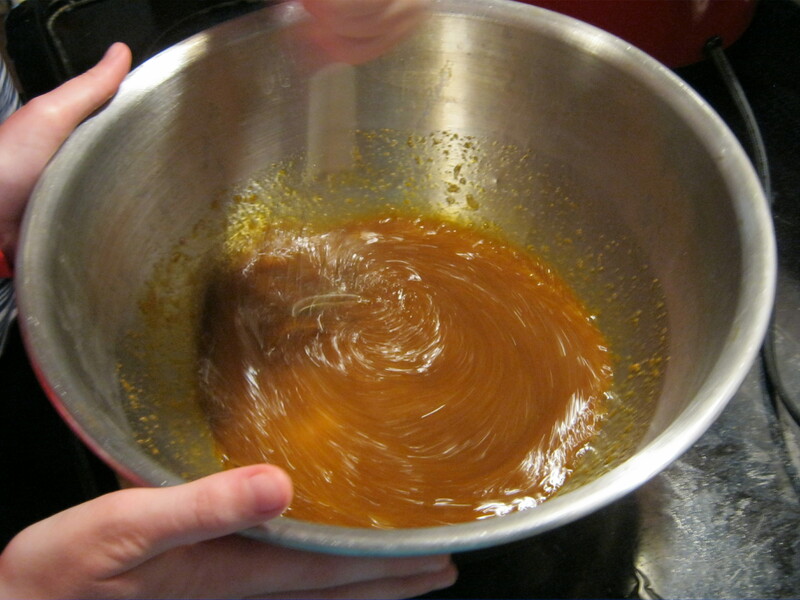 Whisk the dry ingredients into the wet and mix rapidly. 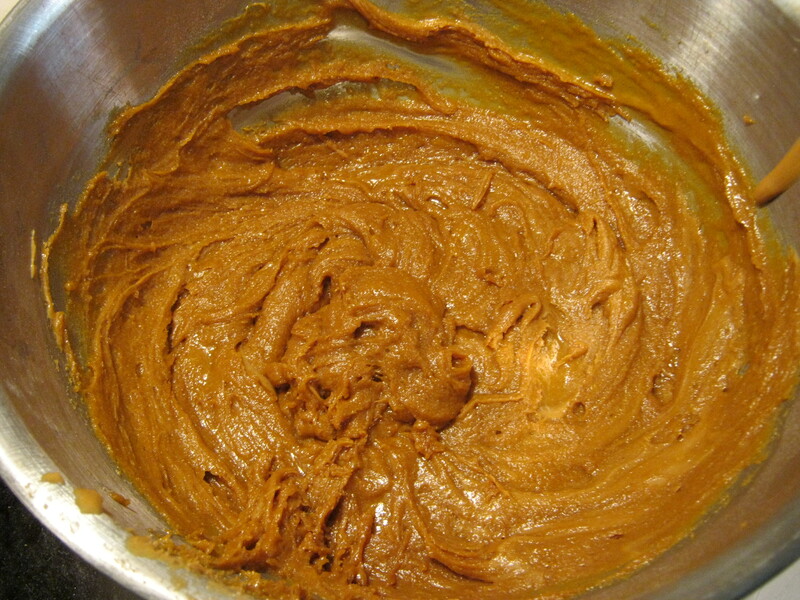 Then quickly whisk in the peanut butter. 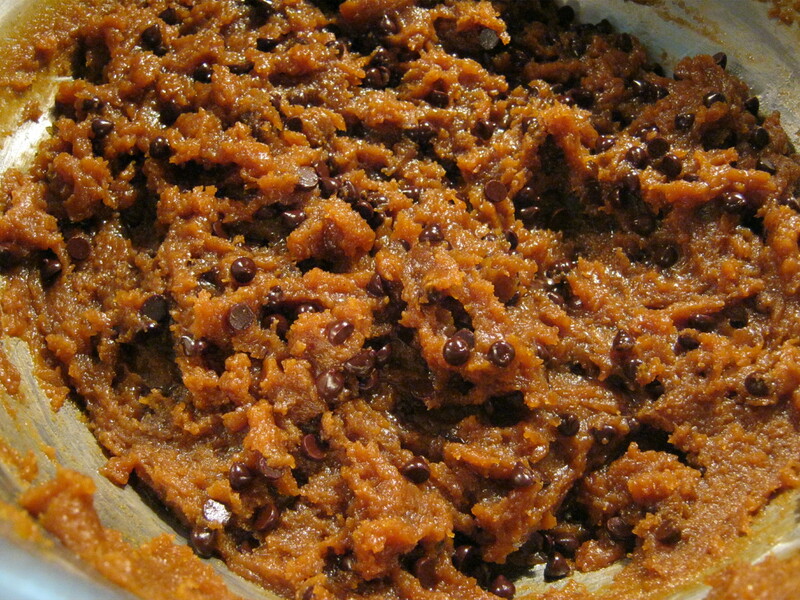 Then stir in the chocolate chips. Note to self: Next time, put the chocolate chips into a measuring cup instead of letting the kids dump the whole bag in by accident. Whoops. Chill the dough until firm. 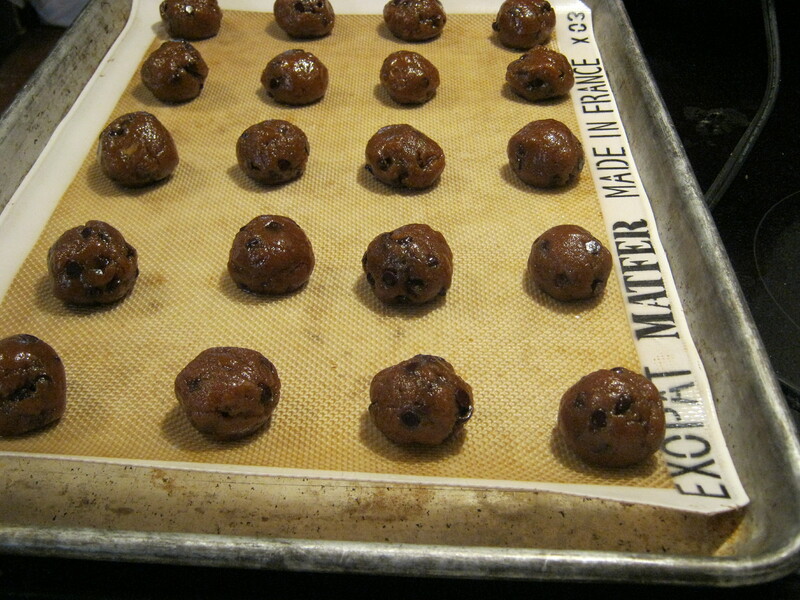 Roll into balls and place 1-inch apart on a cookie sheet. The balls will feel greasy, but if they’re cold enough they will roll just fine. Or flatten out the balls. The unsquished balls make puffy cookies that are slightly gooey inside. 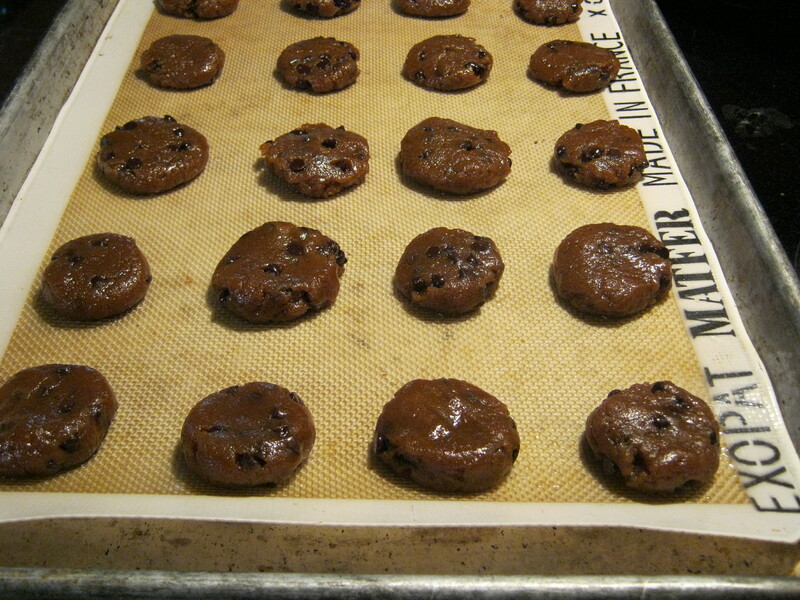 The flattened dough balls make traditionally-shaped cookies with no gooey center. I personally liked it this way. Preheat your oven to 350 degrees. 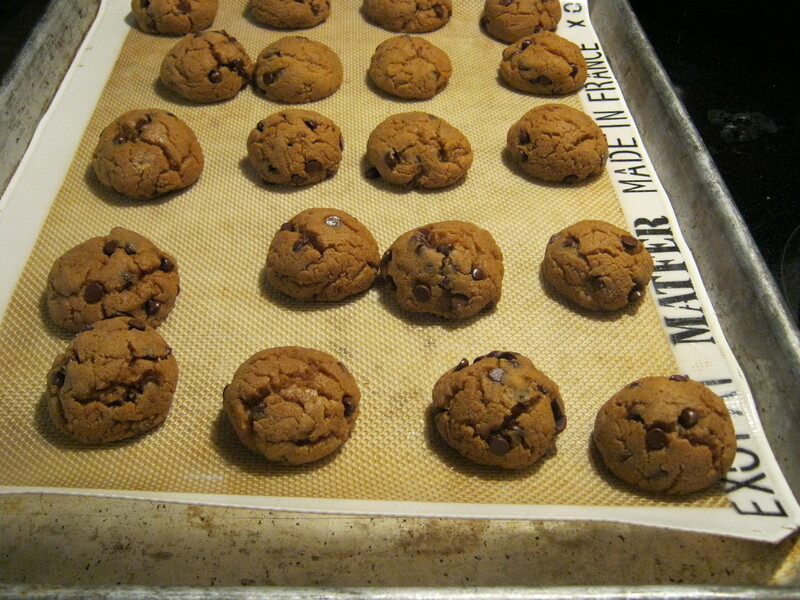 Lay a silpat in your baking sheet, if you have one, or you can use parchment. However, the dough has enough fat you don’t have to do either. 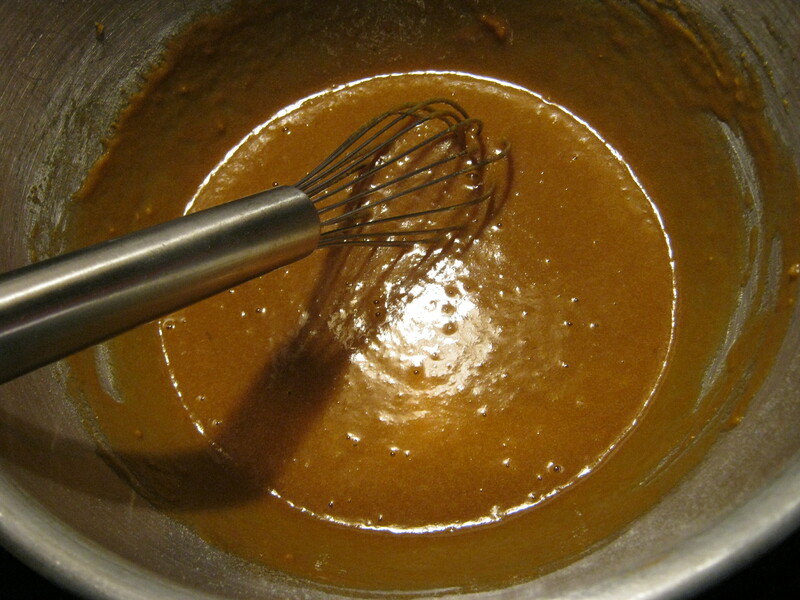 In a bowl, whisk the egg, vanilla, Concentrace, rapadura and salt and allow to sit until the rapadura is mostly dissolved. 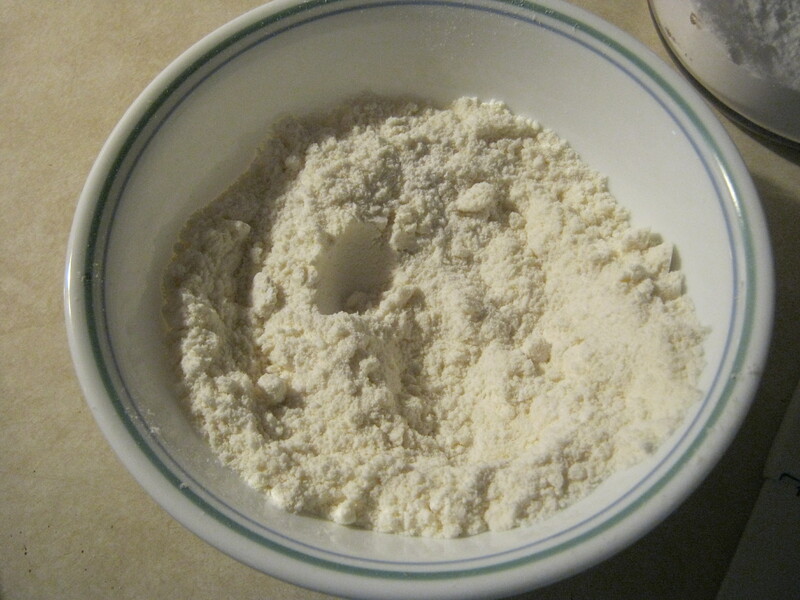 Meanwhile, in a separate bowl, whisk together the baking powder, coconut flour and powdered stevia. 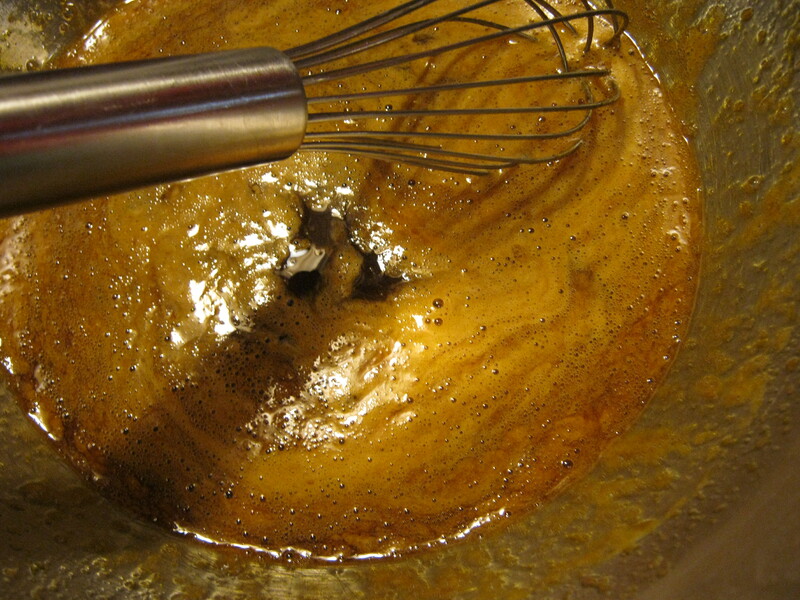 When the rapadura is dissolved, rapidly whisk in the dry ingredients followed by the peanut butter. Allow to sit for 15 minutes for the coconut flour to absorb the moisture, then place the bowl in the fridge for 1 hour or until firm. Scoop out by two-teaspoon portions (the measuring spoon, not the eating spoon) and roll into small balls. I used a cookie scoop to quickly make small, uniform cookies. You can leave them as balls to make puffy cookies that are slightly gooey in the middle or flatten them into discs to make cookies that are baked through and traditionally shaped. Place the balls one-inch apart on a cookie sheet. Bake for 11-12 minutes or until done. This dough freezes beautifully. I normally double the recipe, make one dozen and freeze the rest of the dough. do you think we could do honey instead of rapadura/stevia since we’re on GAPS? Abi, I’m sure honey would work well, but since honey is a liquid I’d reduce the eggs. Then be prepared to add extra coconut flour to get the texture rollable, if needed. Personally, this works, but I leave out more water or add even more flour, bake even lower for even longer that recommended. Everything is thinner, more crumbly, less crunchy. 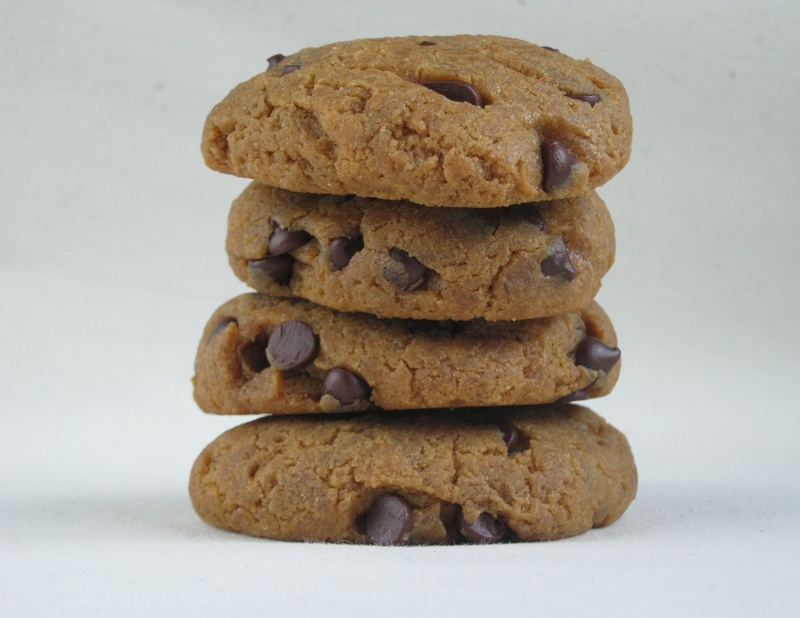 There are certain things that just don’t cook well with honey, and cookies really is one of them. 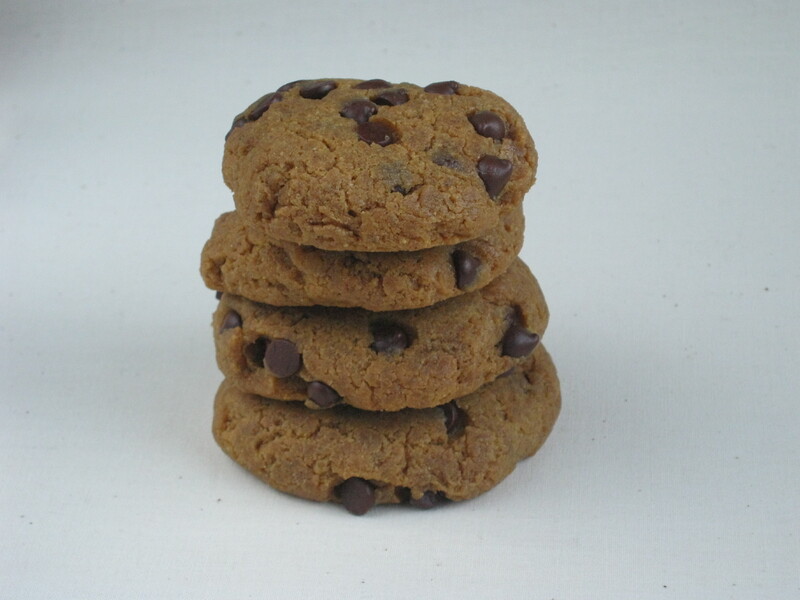 I use honey for 95% of baking, and still haven’t made comparable cookies. Beautiful cookies and great-looking recipe!! Thank you for sharing! These look great! Nice KerryAnn! Can I ask the reason for the Concentrace please? Adrienne, it’s a trace mineral supplement. Since we’re still working on healing one of my children’s dairy intolerance, I sneak it into every single food he gets. Are any of the trace minerals wiped out by the heat of cooking? I have never thought to put them in a baked good, so I have never thought about this before! Kendahl, it’s the same trace minerals found in sea salt, as that is what it is made from. So I don’t believe it is harmed by cooking any more than salt is. Trace minerals are inert and they aren’t volatile, so I don’t believe it’s going to have the same issues as some herbs do with heat. How much NuNaturals stevia do you use to equal 3/4 c sweetener? Also what brand of chocolate chips do you prefer? Rhonda, I use Enjoy Life chocolate chips. The amount of stevia you use will depend on which type of extract you choose. I used a scant half-teaspoon of the stevia we’re currently using- http://iherb.com/p/15704?at=0&rcode=ked184 I prefer to add a minimum and then work up to just the right sweetness, tasting as I go. This sounds easy and yummy. I have a question about adding peanut butter or other nut butter. My daughter cringes at the sight, smell or taste of peanut butter and peanuts. Will this recipe hide it well? Thanks. Yogi, you can still taste a mild peanut flavor. I’d suggest using a different nut butter, such as sunflower seed butter. Dale, I don’t see why it wouldn’t work. Please give it a whirl and let me know how it goes.